This Holiday Caravan is 36 feet long and 12 feet wide. The van is situated at the far end of the site on the out skirts. It is fully equipped the only thing i dont supply is towels. The van and site are dog friendly and the dog exercise field is 1 minute walk away. If you dont want to use the site facilaties there is a pub 2 minutes walk away which is dog friendly also a chip shop and co op, 10 minutes walk is another lovely pub also dog friendly. You can access the beach via a footpath from the site which is a flat walk and takes about 10mins, also some lovely local walks. There is a bus stop out side with bus into Weymouth.The van is ideal if you want a family holiday or just 2 of you for a lazy break even during the autumn and winter. Parking is right opposite the van so no lugging baggage miles. On site facilaties include swimming pool, entertainment,bar and shop along with many activaties for children. All the facilaties need a pass and is not included in the price of hiring the van. 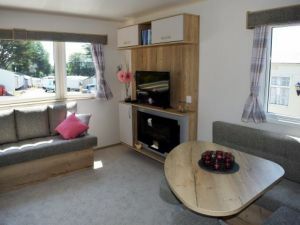 This listing for a privately owned static caravan rental has been viewed 834 times.